It seems like an endless quest that tests your willpower at each duff or patch of grass that goes flying past your head. Summoning just enough power to keep your toys in the bag, where they belong, you feel the tear of frustration fill up your eye socket as you begin grumbling to yourself. You swing again, and wow, that was a new meaning to fresh air. Once again you try to control yourself, but alas, your once very pristine one wood is now firmly wedged in the old oak at the first tee. Golf is an unusual game that will require every waking moment of your attention to achieve master’s results. Some golfers strive for it their whole lives and others, more naturally adept to the sport, reach it before their twentieth birthday. The scratch handicap is like the hole in one, attainable but just one over par and the scorecard will make you weep. Becoming a scratch in golf is a combination of hard work and discipline. You need to practice and hone your swing to perfection. Scratch golfers are not born they are made. Golf enthusiasts looking for tips on how to become a scratch will be delighted with the following tips, aimed at advancing your skills for that perfect scorecard in golf. The dreaded reflex, talked about in every golfing magazine and between all golfers at the nineteenth hole, reminiscing on the day’s events. Bringing your attention away for just a second, as your mind allows you to conceive the ball flying straight down the fairway like an arrow piercing the red bulls eye. You’ve missed it; the failure to connect with the ball sends your brain twitching like a snake in the sun, as your mind was almost sure it could not be missed. Reflecting, you realize that you have made the same mistake you always do when playing a shot of this embarrassing magnitude. The first rule of golf is to always keep your head down. Focus on the ball and only lift your head once you have a solid connection between metal face and white blimp, that should be hurling down the fairway at the speed of light, in a sophisticated poise that allows you to track it’s safe, plush landing on some expensive real estate. Right, you’ve got your head glued to the white dot, your progress in this department allows you to feel the kind of confidence a child has after taking the training wheels off a tricycle. What’s this, another issue? Your arms feel like lead as your head sits firmly planted in a fixated gaze on the white dot. Your arms, eyes and brain now feel like separate entities unable to communicate with one another to perform a basic task. The second rule for any golfer in quest of the elusive scratch handicap is to allow your arms to follow through with the natural movement of your body, as you connect with the ball and watch it take flight. Remember to keep loose enough to have a dynamic sense of play and rigid enough to control your swing. When you get it right it’s as exciting as hitting the jackpot when playing Australian pokies! 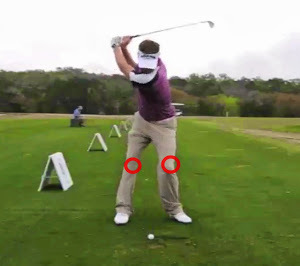 You can’t expect to be a scratch handicap if you are a rigid robot that is unable to bend your knees as you swing into the ball. Once you fail to bend your knees, you aren’t playing a shot; you’re dancing with the ball as if it were a snake you’re trying to charm at a distance with a death stick. Bend your knees ever so slightly; dip forward into the foot that aims into the direction of your play. Trust your body to understand what it must do and relax. The more tense you are while playing golf the more you won’t achieve. To be a scratch you need your body to move in its natural flow as you follow through with the momentum that gives the power to your shot. Never try and hit the ball like a hunter gunning for a prized trophy in open season. Instead, relax your entire body; let the club do the work while your body follows its natural motion that results from sticking to the basics. Have fun and enjoy the game, relax and remember to allow for a dynamic sense of movement to discover your swing. Follow these simple rules of golf and you may be a scratch handicap quicker than you had imagined.